Who would have thought? We are on track, and that €5 is and will make a massive difference. With more and more people signing up to save this Park, all our objectives will be achievable over the coming years but we can only do this at the pace we would like if everyone is participating. So add you name to the list, get your monthly €5 set up ASAP so we can continue brightening the future of Johnstown immeasurably. Don’t put it on the long figure as our debt restructuring deadline dates are very close. The standing order form and the debt agreement form are both available on this website and will only take you 2 minutes to fill in. Mark it down on your to do list for this week. We know there are many left who intend to set this up but haven’t had time yet, but we can only plan the future based on what money we know is coming in and this standing order allows us to do that. We have had several very positive discussions with Johnstown Football club about them returning home to practice and play in the park. They are very interested and we all want to ensure that we do this correctly. All insurance and service agreements will be in place before any contract is agreed. Furthermore security will also need to be in place and a suitable car parking facility will need to be installed to accommodate any extra vehicles as we cannot allow our narrow streets to be choked up any further. It is a while off and we will keep you updated here. As part of our Member’s Benefit Package and our affiliation with Lyoness – The worldwide Leader in one-for-all loyalty cards, we now have the hard (wallet-version) cards available to accompany the digital card on your phone. 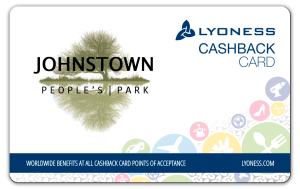 We would encourage every member to register for their card as this card will also act as a membership card for Johnstown People’s Park and may be requested when looking for our discounts in all park sponsoring shops and businesses. You can only register on this website. So hurry and register and your digital card will be ready straight away, with the physical, plastic card posted out within a few weeks. Every member (over 18) of every home is eligible for this membership card which now features our unique JPP Logo. Get yours ordered today, register for free here. 1. 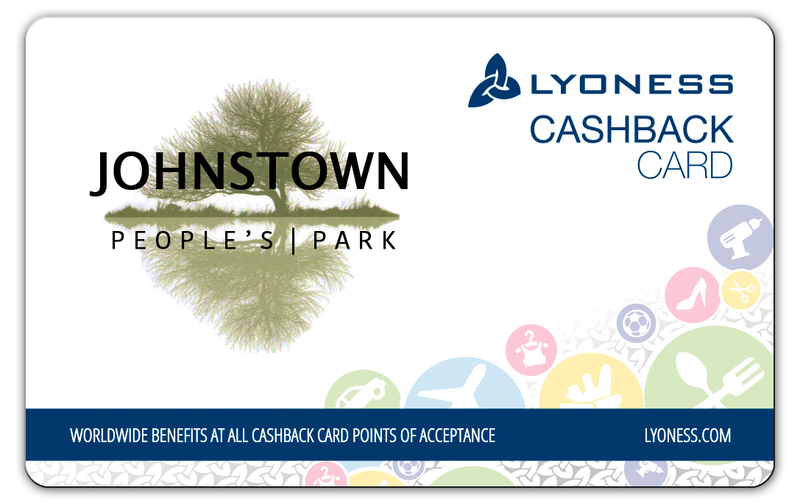 Buy Gift Cards directly from the Lyoness office. 2. Buy Gift Cards from a number of voucher selling points around Ireland. 3. Order your gift Cards on line by automating the process with a standing order. Once the Gift Cards are purchased, you shop as normal in your local TESCO store. Hand the Gift Card to the Cashier when you are at the checkout and paying for your groceries or fuel. You do not have to show the Cashier your Lyoness Cashback Card at the till. You will get great value at Tesco whether you are shopping for groceries, clothing, gifts, entertainment, hardware, home ware and so much more. With 149 stores in the Republic of Ireland and 22 petrol filling stations, there are lots of ways to get even more value with your Tesco gift card. Based on a weekly grocery shop of €200 this would equate to €208 cash back over the year – This is some good savings with Tesco alone!!! Hurry and register for your card here. For full details visit our new “Hotel Breaks” section on this website. Please visit our Member’s Benefit Section on this website to see our newest additions. These include Staunton’s Pharmacy, Adventure Bouncy Castles, SJM Digital Solutions, E.K. Tilers & Ken Butterfield Car Valet service. As before, we are still in negotiations with many more local and national companies who are keen to support our community in their own unique way and these will be updated here and on all future member’s flyers. There are a lot of savings to be had by keeping an eye on our park sponsors. These stickers are issued to all homes who have signed up to save the park. Please display your sticker on the inside of your front window. They will also stick nicely inside a car windscreen. This is to highlight the people who care about their community and to encourage others to do the same. We have broken the mould here, let’s not be afraid to show it!! Park Paid 2016 stickers will be automatically issued in the New Year. We are looking at ways to reduce the workload of the directors and reduce costs at the same time. We would like to use “Street Reps” made up of local volunteers just to help us with specific deliveries. For example, each person would be assigned a Street (it doesn’t have to be your own street, in can be far away) and they would simply be responsible for delivery to that street without the need for us to put a stamp on the envelope. So when we have invoices or individual letters for 20 – 30 houses on that street you would simply deliver them. You would not know the content or be asked to get into discussions about JPP polices or accounts or money. You would simply have a certain number of houses assigned to you for deliveries. If you think you could spare 20 minutes every so often for this please contact us at info2jpp@gmail.com or by phone 083 4489714. If we had 15 people happy to help at this it would significantly lower our work load and the costs of postage. There is a regular litter patrol of the Park and the surrounding areas. AES Waste has donated a regular 240ltr waste bin and a 240ltr recycling bin that they collect weekly as part of their rounds. The Litter Patrol ensures they get these bins full before collections. If you would like to help out as part of this litter patrol, please contact us at info2jpp@gmail.com. If you are part of the Litter Patrol, you would simply be sent a text when the next patrol is taking place. You only need to let us know if you can make this one or not. Even if you only got to do it a few times in a year, it all makes a big difference and brightens up the area. Safety gloves, safety glasses, litter pickers and bags/bins are always provided. To follow up from our Spring Clean we are planning a big clean in September to clear as much as we can before the winter. We won’t be holding out for good weather in September so you might get wet. A huge thank you to AES Navan who has again donated 2 large skips for the occasion. AES have pledged to donate these skips for 3 years for our Spring and Autumn clean up days. Judging by April’s clean we know they will want to collect the skips by lunchtime so if we said anytime from 10am to 1pm. If you can send us a text or an email if you plan to be there so we can count the numbers and ensure we have enough safety gear and we may need to gather a few more brushes etc. Also in case we may need to advise you if there is any need to change the date due to unforeseen circumstances. There were over 30 volunteers in April and it made light work with so many people. Let’s see if we can get a few more out this time. 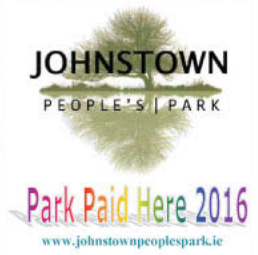 As Johnstown People’s Park was created in very late 2014 with the intention of separating the past and the future of this park, we have decided to close the accounting period on the 31/12/2014 also. Our accounts previously went from October to September. We are also including the final months of 2014, so the next accounts filed will be for 15 months instead of 12. When it is time to file the 2015 accounts, they will reflect Jan-Dec 2015(more importantly, the 1st year of JPP). Keeping it simple and measuring our progress. All accounts will be available for download on this website. Tear them apart!!! We assume that MCC are working hard on the designs for our approval. We would anticipate an update in the near future and will update you here as soon as we have any more information. An E.G.M. (emergency general meeting) as announced, took place in the Ardboyne Hotel at 2pm on 25th April 2015 with only one item on the agenda, namely to vote on the granting of an “agreement in principal” to lease an area of the park to Meath County Council (MCC) for the purposes of building, maintaining and insuring a children’s playground to be open to the public. At this EGM there was a unanimous YES vote to the proposal. We will now meet with MCC for further negotiations regarding more exact specifications of the proposal. We will be pressing the issue that car parking facilities will also need to put in place to accommodate this proposal. We will keep you up to date when a more detailed design is presented. On the 1st of May 2015 our mobile security patrols commenced for a continual assessment period. We have authorised approximately 730 annual patrols at key times and at with secondary follow ups by the security team if deemed necessary. They are tasked with ensuring that the park rules are adhered to and will be permitted to instruct people who are not acting in accordance to these rules to vacate the area as it is private property. The new Park rules where hung at 8 locations around the park on the 30th of April 2015 and are available on this website for download. The key words here are “Private Property” which gives us to power to restrict any behaviour deemed unacceptable and with the added bonus of being able to call on the Gardai as any illegal act is covered by their remit whether it is on public or private property. Over time we will restructure these patrols to be more focused on key locations and times based on the knowledge we are gathering. All instances will be recorded and if necessary, any information needed will be passed on to the Gardai for prosecution. Private civil prosecution is also an option. JPP will hold their first official A.G.M. in the late summer 2015. If you require any issue to be raised please contact us as soon as is possible so we may add the item to the agenda. At this first official A.G.M., we can openly address and/or discus any item that effects the park us as shareholders with a view to finding the best solution going forward. We would hope to clarify numbers attending so as soon as we announce the date and time please notify us if you think you will attend. Normal grass cutting has resumed in April 2015. Although we have not yet secured the entire year’s grass maintenance fees we are able to make a start and with increasing and continued member financial participation we hope to be able to continue this most basic element of maintenance into the future. We have been advised that we do need to up the frequency of the grass cuts to get the desired results. Ideally going forward there should be 21 cuts during the growing seasons. We may be a bit from that in 2015 but by everyone paying their €5 monthly fees, it allows us to budget ahead of time and know what money we can expect in future months and years and budget accordingly. Currently the grass is cut every 3 weeks approximately during this growing season, but bear in mind that we have been at the centre of a financial drive during this time. Ideally this should be every 2 weeks and we aim toward this for 2016. We have priced and are expecting to move ahead with the tidying up of the bushes to the rear of the park (backing on to the Millbrook Apartments). As this is currently an area where litter of all descriptions is accumulating and proving to be a health hazard and we have seen a rise in antisocial behaviour in and around these bushes. We are awaiting clarification and confirmation (in writing) from the Irish Parks & Wildlife Department, so we are in compliance with “Section 40 of the Wildlife Act 1976”. There is more to the act, and we are seeking clarification to determine what exactly can be described as cultivated land. Failing clarification before the summer, these bushes will be pruned back on or soon after the 01/09/15 with the intent of reclaiming a large area of grassland to the rear of the park to stop litter and other health hazards accumulating there. In this first case we will just be bringing the shrubbery back to acceptable levels but a more permanent solution may be warranted in the future if Millbrook Apartments are open to discussion on acceptable solutions. It is proposed to set aside approximately 2k every year for the next number of years to plant a better variety of trees that will add shape and colour to the park as it ages. We have been told that park will easily accommodate another 100-200 trees without taking up any ground space. These trees will be pruned to a height, so growth will ideally be above 6ft. Bare root trees are usually planted in or around October and we would hope to be able to get started this coming October 2015. It is proposed that when we have the finances, to build a walking/running track around the circumference of the park and that this pathway would be tree lined on either side, so hopefully in the future it might provide a canopy of tree cover over this walkway. The walking/running track will cost us a bit but there is no reason why we cannot plant the trees in anticipation of the walkway. € 2k will get in or around 30-35 trees which will need to planted in succession every year to get the intended results. This walkway is in the design stages and we are awaiting a price guide. Please watch out for these trees and the older ones, and report any abuse to the Gardai and ourselves. Any instance of vandalism is considered a criminal act. Again, this is in the planning and relatively inexpensive for the results. The proposal is to target the front area of the park (and also any section containing a copse of trees) with a variety of Spring flowering bulbs that will blossom in succession when next Spring arrives. Again these bulbs need to be planted in the Autumn and we are gearing up for this right now. The beauty of this is that they will return each Spring so we only need to plant them once. We have received 3 quotations on this and there are many options. We are of the opinion that CCTV is a must, especially if we are planning further investment and amenities in the park. (Start as you mean to go on). We have sought permission from Meath County Council (MCC) to use the existing public street lighting to facilitate the mounting of 7 – 9 wireless monitored cameras which would record all activity within the parks boundaries 24/7. This would be linked to a remote recording station and the files would be available for authorities for any reported illegal acts. MCC have sighted insurance clashes regarding this but we are still hopeful of a compromise. Failing this agreement we would have to wire the park underground and erect several tall poles to mount these cameras. The cameras and the monitoring is not the expensive part. Digging up the sections of the park to lay cables is the most costly part to this, and if we have to go down that route we may as well lay cabling for future floodlighting of the park (To save us doing it twice). Hopefully we can get a result from the council and we can get this project moving sooner rather than later. We have as advised, applied for a Pre-Planning permission meeting with MCC as to guide us in the correct approach to obtain permission for use of the existing street lighting to mount our state of the art CCTV system. We have highlighted that it can be arranged for the local Garda Station to have real time access to these cameras if preferred and seen as an advantage. We have also included one extra camera covering the front entrance to the Priory and one extra camera covering the main entrance into Boyne View, Millbrook and Spire View. With these two cameras alone we would have footage of any vehicle entering or leaving the 4 estates, any time day or night. Using number plate recognition technology, this will prove a major advantage to preventing crime in the area, and a necessity when seeking prosecutions. We have received quotations and recommendations on this and we would hope to achieve this before next Spring. Although the fence itself is supposed to be maintenance free, we think a fresh coat of dark metal paint will highlight and compliment the greenery and trees inside the park. We are told that it would only need to be repainted every 5 years or so. In the short term we will look at pricing a clean of the railings and supporting walls including the graffiti. As well as advice from our official horticulturist and landscapers (externalworks.ie) the town’s Gardener was good enough to visit and offer suggestions on many aspects of the park. We have not yet, but are looking at pricing lager (council style) hanging troughs to display Spring and Summer flowers around the park, most likely on the exterior fences. There are other options we will price up for example tall poles suspending baskets throughout the park. We have sourced suppliers of both the flowers and the equipment and whilst the cost of the flowers may be annual, the cost of the equipment may not. Any equipment priced would be done so with the intention to ensure we can keep “intentional damage” to a minimum. We specifically looked to the council on this matter as they too must need to consider “intentional damage” and yet they manage to provide floral displays in every town in Ireland. Most of this equipment is taken down for the winter and stored and reused each year, so after we do it once we will only have the cost of the plants themselves which when bought in bulk are not as expensive as you would think. However these plants need careful consideration and would need to be ordered 3 months in advance. We would also need to ensure they are fed and watered. This is not something that will happen immediately but we are looking into it. We do not wish to ruin anybody’s fun on Halloween night, but as we are trying to redevelop the park, we must highlight that having a bonfire in this park is not condoned and it is also an illegal act. Also on Halloween night 2014 there were numerous illegal acts reported to ourselves and An Garda Siochana. We have learned from these incidents and are in the process of applying several measures to ensure they are not repeated and any breech is reported. Also, the Park will be under 24/7 CCTV. As much as possible please continue to report every instance to the Gardai and ensure that they take a note of the calls, especially in the weeks and days leading up to Halloween night. We would also politely ask that home owners not donate fuel and/or store any items that are intended to put into a bonfire located in the park. Any instances of illegal acts should be first reported to Navan Garda Station and also to us at info2jpp@gmail.com . Please note that in the 2 weeks leading up to October 31st 2015 our mobile security patrols will be somewhere in the region of 5-10 unannounced patrols daily to combat and deter any storing of materials. – Any footage taken will be used towards prosecutions. This entry was posted on Wednesday, July 22nd, 2015 at 10:06 pm	and is filed under Uncategorised. You can follow any responses to this entry through the RSS 2.0 feed. Responses are currently closed, but you can trackback from your own site.